Each of our natural mined diamonds is hand selected for exceptional beauty and verified by our staff gemologists. We source primarily diamonds cut from Canadian, Russian & Botswanan rough (which includes Namibian and South African material). 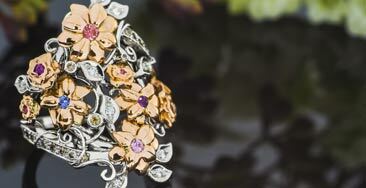 We also offer recycled antique diamonds as well as colored rose cut diamonds, usually cut from Australian rough. Green Lake is committed to sourcing diamonds that benefit their communities of origin and are mined and where fair labor standards and excellent human rights records prevail. 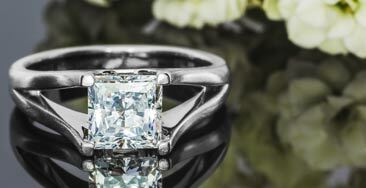 Advancements in chemical vapor deposition, high temperature - high pressure and other technologies have enabled a few specialized facilities around the world to literally ‘grow’ gem quality diamonds from pure carbon. 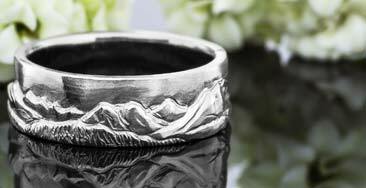 Under a controlled environment the carbon is formed into diamond crystals that are precision cut and polished just as a diamond mined from the earth would be. These are not simulants – these are real diamonds that are virtually indistinguishable from their mined equivalent, even to gemological grading agencies. In partnering with America’s most esteemed and pioneering private laboratory, Green Lake Jewelry Works is proud to offer our own Grown Diamonds collection. In order to get a beautiful, brilliant diamond at a price you can afford, we have to look at 4 characteristics. 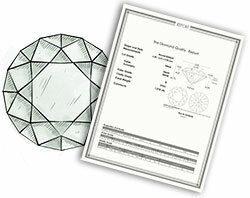 A diamond's cut grade refers to how well its facets interact with light. Brilliance and scintillation are what Cut is all about! 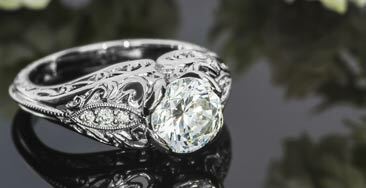 A well cut diamond has more life and sparkles more than one of lesser quality cut and simply looks better. Cutting away more rough to get a perfect cut grade makes a well cut diamond a bit more expensive but the difference is a visibly superior Gem. 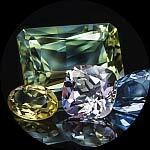 Diamond color is graded from D, which is completely colorless, to Z which has more a visible yellow to brown body color. 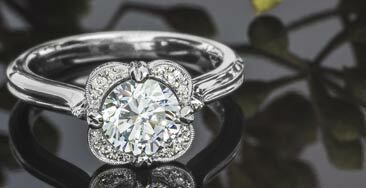 Although colorless diamonds are rarer and more expensive, the best color is truly in the eye of the beholder. 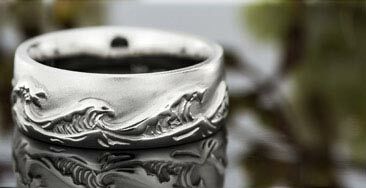 Choose the color, or lack of color, you find most appealing and the best value. Fancy color diamonds have a completely different color grading system and are rarer and often much more expensive. Fancy color can vary from distinct yellow to browns, pink, blue and many other unique and rare one of a kind colors. Inclusions are evaluated using four basic criteria. Size: How big are the inclusions? Quantity: How many inclusions are there? 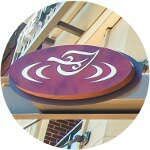 Location: Where are the inclusions located? Color: Are the inclusions colorless or do they appear dark? 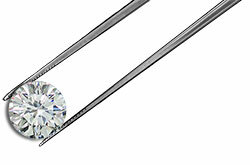 Points and Carats are units of measurement used to express the actual weight of a diamond. 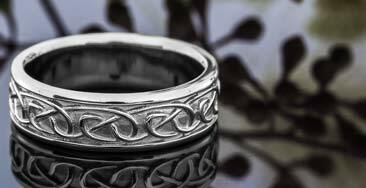 There are 100 points in a carat, 5 carats in a gram and 28.35 grams in an ounce. 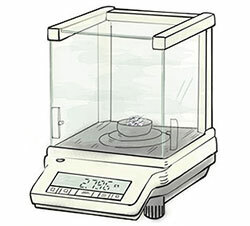 This weight is measured by a very sensitive scale called a carat scale, which shows the weight in carats and points. 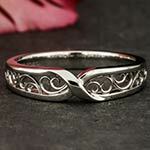 The easy way to remember points in a carat is they are the same as pennies in a dollar. 50 points is a 1/2 carat, just like 50 cents is a half dollar. 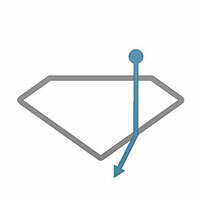 1 Carat = 200 milligrams, but carats are usually subdivided into points, for instance a .50 carat weight diamond can be called “50 points” or a “50 pointer”. 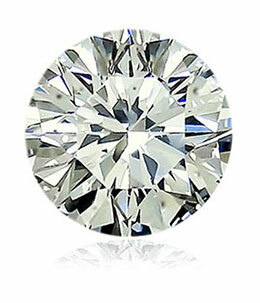 A diamond twice the weight doesn’t really look twice as big, but will cost well over twice the price if the same grade. The Clarity affects the rarity - therefore the cost. Diamonds tiny internal markings are called inclusions and are graded under 10x magnification. 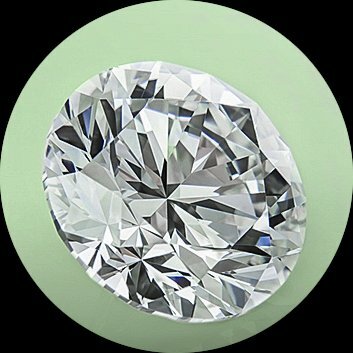 When not visible to the naked eye, inclusions have little effect on the visual beauty and brilliance, however, they dramatically affect the price. No inclusions visible (by an expert) under 10x magnification. Minute inclusions; extremely difficult to find under 10x magnification. Minor inclusions; difficult to find under 10x magnification. Noticeable inclusions; relatively easy to find under 10x magnification. Obvious inclusions under 10x magnification. This is the single largest clarity group. Obvious inclusions under 10x magnification. Easily visible to the naked eye. 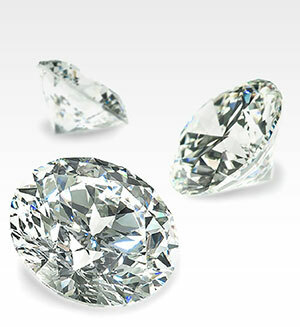 *SI3 is not a GIA grade, but is used by some other grading labs. 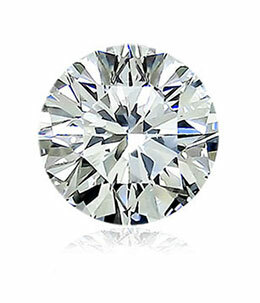 Most people prefer colorless diamonds, but subtle color differences can be hard to see. Color is the most subjective of the 4 C’s, so there’s no right or wrong choice. 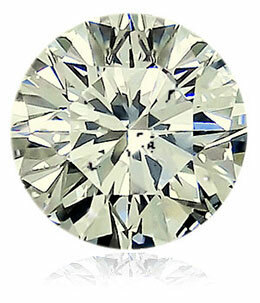 Colorless and near colorless diamonds (D-J) appear more white. 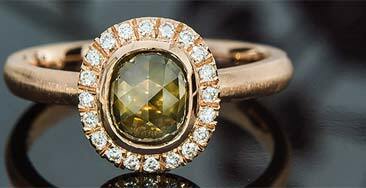 As you go below the near colorless range, a diamonds color, primarily yellow, is more noticeable and will affect rarity, appearance and ultimate cost. Some people prefer a warmer body color, fancy colors ,or simply don’t notice a bit of color. 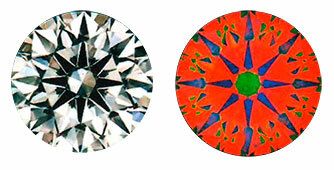 The color of metal in the gem setting also can affect how noticeable a diamonds color appears. 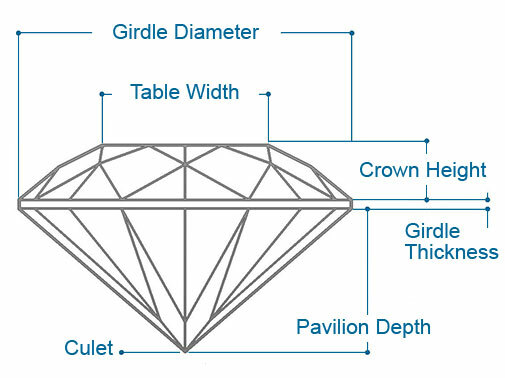 Diamond cutters often compromise brilliance to obtain the largest possible finished diamond from the uncut crystal, resulting in a diamond that is larger, but one that is often poorly cut and therefore less brilliant. 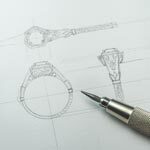 We hand select our diamonds for the most beautifully cut. 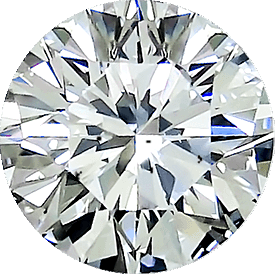 A properly cut diamond is cut to strict tolerances that are designed so your diamond will display excellent optical brilliance. Red indicates the brightest areas of the diamond – areas that attract the brightest light from above. Green also indicates light return; however, from an indirect source which is not as bright. 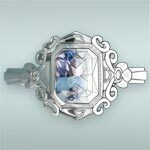 The blue indicates a contrast pattern of dark reflections giving the diamond its personality. 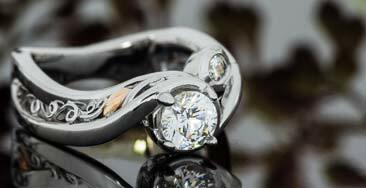 Although smaller in weight the properly cut diamond will always stand out as the most beautiful. 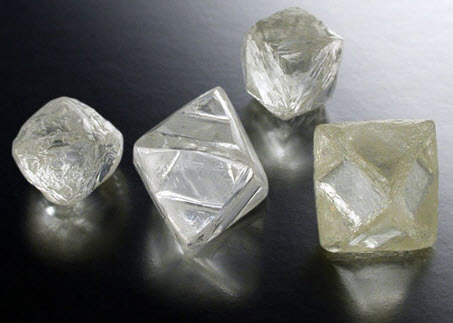 The origin of each earth-mined, rough diamond creates unique characteristics within. Most mined diamonds contain microscopic particles or trace elements that formed at its birth deep underground billions of years ago. These trace elements can make two identically graded diamonds appear quite different. One might appear dull and lifeless or just less bright, although everything on the certificate says it should be as beautiful as the identically graded stone it’s next to. We call this "bad rough", you will simply see it as a less beautiful diamond; although it doesn’t appear on any certificate, this is another of the magical properties of diamond that makes each one unique. Lab grown diamonds, although often purer and less likely to have random trace elements present, do have crystal imperfections, called inclusions, which are virtually indistinguishable from their earth-mined counterparts. 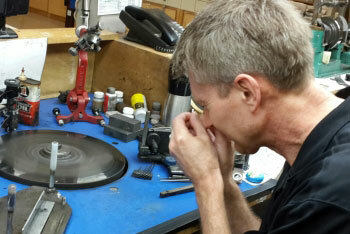 We carefully and individually inspect each of our diamonds for beauty and reject far more than we accept. Although two diamonds may look the same to the naked eye, when viewed under 10x magnification one has fewer inclusions, making it rarer. While this rarity makes one more expensive than the other, both diamonds are equally beautiful and brilliant to the naked eye. 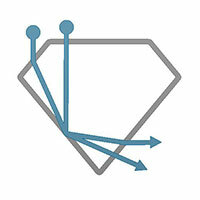 Both diamonds appear to be the same. Get to your perfect price with the perfect diamond by deciding what’s important to you. 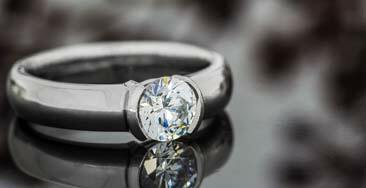 A larger stone with lower color and clarity may cost the same as a smaller, higher grade diamond. Is a little color ok to you? Can you see the inclusions? 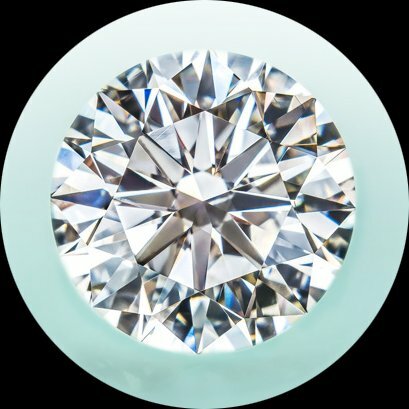 Then, adjust the color, clarity and size (the cut should never be compromised) and you will end up with the perfect diamond at your perfect price! 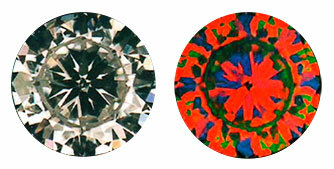 You lose the ability to judge both color and clarity when viewing mounted diamonds. A diamond may look fine when it is mounted, but there may be hidden inclusions or damage under the prongs which can severely impact its value. A mounted diamond will also appear to be a higher color grade than it really is. This is why the world's top Gem Labs will not certify mounted diamonds. 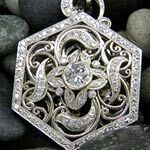 Most stores use special lighting to enhance their products, and the jewelry industry is no different. But did you know that professional diamond buyers do not use the same lighting buying diamonds that most jewelers use to sell them? 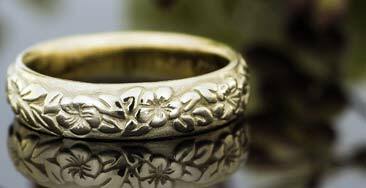 Most jewelers want the diamonds to appear better than they really are. This is the difference between actual brilliance and perceived brilliance. 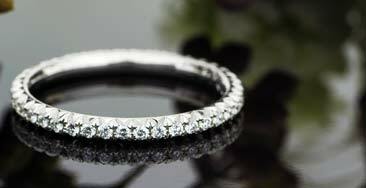 Most jewelry stores use lights that mask a diamond's color and enhance sparkle. 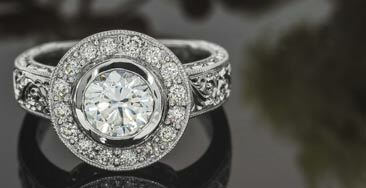 In this type of lighting even poorly cut diamonds will look brilliant. 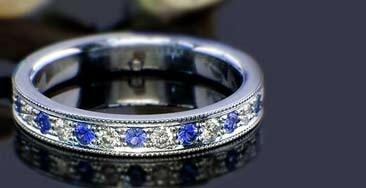 Always look at diamonds against a white background using non-enhanced lighting which most closely resembles natural light. 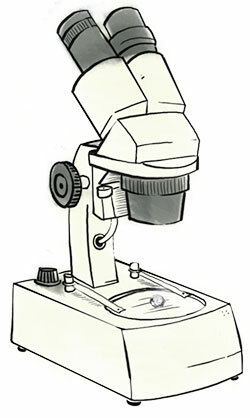 Diamonds are certified using binocular microscopes, not loupes. Any eye doctor will tell you that your eyes work with each other to focus and give depth perception. With a hand-held magnifier or "loupe" you use only one eye, making it difficult to focus into and through a diamond. The end results is you can miss seeing some of the imperfections and end up buying a diamond that is lower quality than you thought. 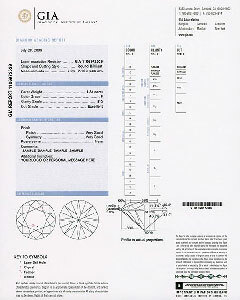 A diamond grading report, commonly called a cert., is a useful assurance that an independent expert has graded your Diamond. The labs we use most are GIA and AGS. We cherry-pick our diamonds from large parcels using an OGI diamond measuring system, an AGS ASET light performance scope and very experienced eyes! We select the most beautiful and best values and guarantee our grades. When these are sent off for grading reports, the lab often grades them even higher than we did. 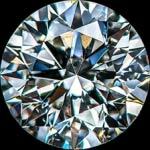 Any diamond sold before going to a lab is guaranteed to grade the same or better at GIA or AGS. 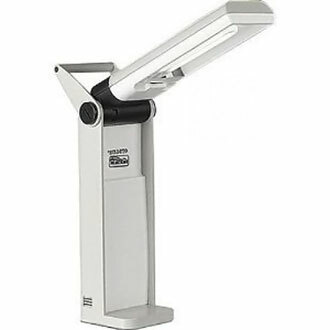 Trust your eyes when viewing diamonds using the proper equipment and lighting. 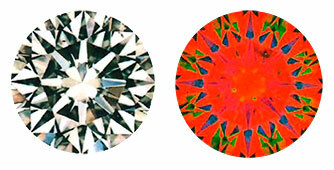 Every diamond has a unique optical personality, and you need to compare several side-by-side to find one that captivates you. 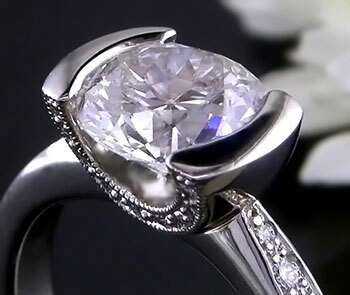 Our diamond is hand selected for its superior beauty and brilliance. However, true beauty is in the eye of the beholder, so it is important that you select a diamond that is the most beautiful and brilliant to you. Recent advancements in chemical vapor deposition (CVD), high temperature - high pressure (HTHP) and other technologies have enabled the growing of gem quality diamonds from pure carbon. 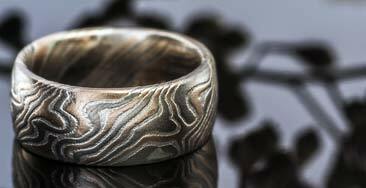 Under a controlled environment the carbon is formed into diamond crystals that are cut and polished just as diamonds mined from the earth are. These are not simulants – these are real diamonds that are virtually indistinguishable from their mined equivalent, even to gemological grading agencies. 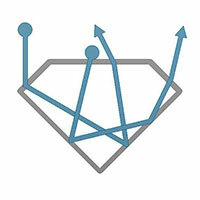 Just like growing a plant in a hot house, lab grown diamonds start out as a small ‘seed’, in this case, of pure carbon. Various processes shorten the crystal development from eons to just weeks. These rough gems are then sent to master diamond cutters just as diamonds mined from the earth, and cut to achieve the best clarity and carat weight possible. 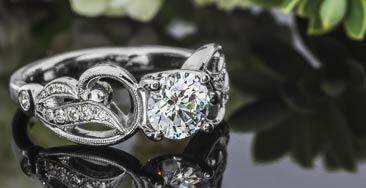 While especially consistent in quality, grown diamonds also demonstrate the same unique and one-of-a-kind characteristics found in mined, naturally occurring diamonds. 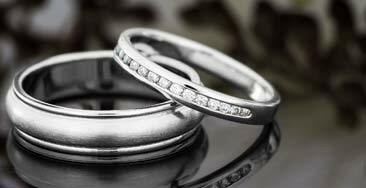 Diamonds mined from the earth and diamonds that are lab grown are chemically and structurally identical. 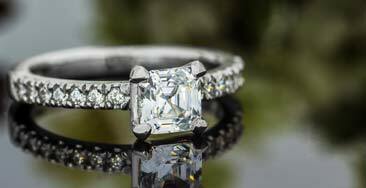 However, with lab grown diamonds, there’s no blasting, excavating or dangerous labor required. Also, creating lab grown diamonds is less expensive than extracting mined diamonds. Finally, the carbon footprint of lab diamonds has been estimated to be about 80 percent less than those of traditionally mined gems. 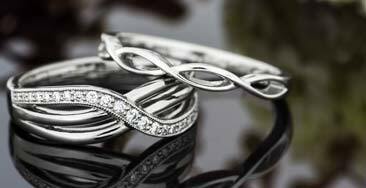 We choose diamonds with the same passion for quality we put into every piece we make. 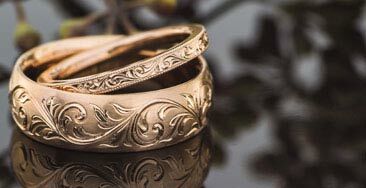 Green Lake Jewelry Works is devoted to crafting exemplary, one-of-a-kind rings and we'll make sure you get a spectacular diamond that you can be as proud of as we are. 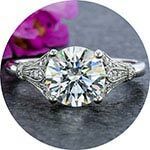 If you are thinking about buying a diamond online, choose a company whose Gemologists and experts personally and honestly evaluate the diamonds for you. We hand select each diamond, and because of our long and personal relationship with our cutters, we negotiate hard for the best value. 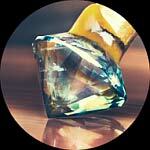 We inspect every gemstone, accepting only the most beautiful diamonds at the best value, and return the rest. Most online sites don’t examine your individual diamond this way; they simply pick from a list and send it to you sight unseen, so your diamond may look better on paper than in person. 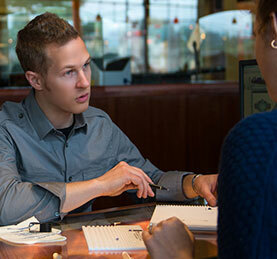 Only buy from a company whose gemologists and experts personally evaluate each diamond the same way we do.